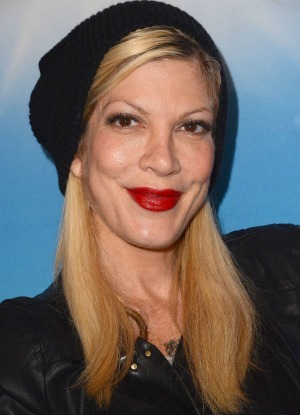 Things appear to be getting even worse for Tori Spelling in 2014. The troubled star is now locked in a vicious feud with her former dog walker. Poor Tori Spelling! Things have not been easy in the Beverly Hills 90210 actress’ life lately: She’s broke, her relationship with husband Dean McDermott is being rocked by cheating allegations and now she has another worry to add to increasing list — her dog walker wants to kill her pet. Apparently, the star is in a frenzy because her longtime employee Claudia has now threatened to take her beloved pet to a shelter and have him euthanized as early as Monday. Why? Because she has yet to be paid. It is no secret that Spelling and her beau McDermott are completely broke, and the pair have confessed that they’ve been battling to make ends meet since their reality show Tori & Dean: Home Sweet Hollywood was canceled. However, none of that seems to matter to her former employee Claudia, who, according to TMZ, was originally the A Carol Christmas actress’ dog walker in 2011, but when the pet got too big for her Los Angeles, California, home, Claudia assumed the responsibility and kept the pup at her home for a fee of $525 a month. Apparently, Claudia was not paid this month and has tried to contact Spelling and her husband about the situation but received no feedback whatsoever. This has deeply angered the woman, who has now threatened to put the dog down if she doesn’t get her cash. Since TMZ broke the news, it has been reported that Spelling has tried to contact Claudia and desperately wants resolve the dispute and get her beloved pooch back. But her former employee has had enough and seems to be dead set on making the Scary Movie 2 star pay — with her dog’s life. We hope the outcome is not as dramatic as that and that Spelling manages to sort out her financial issues and get her pet home in time!